Crimes or accidents: You may have been wrongly accused of a crime or your part in an accident may be in question. Having your DNA profile available and accessible can prove your innocence. Paternity: When questions about paternity arise, the only way to be sure is through DNA. If the question ever comes up, having your DNA profiled uncovers the truth so that all parties concerned can find the answers they are looking for. Families can be reconstructed, adopted children and biological parents can find each other, leading to life altering results. To assist with the identification of missing persons. There are two options to choose from when you are having your DNA profiled. Legal testing clients can choose to come into one of our facilities across Canada or have a mobile unit dispatched to a desired location. During the collection process, the individual being tested is positively identified through government issued photo identification. Certified DNA Specialists will perform the collection, through a simple and painless mouth swab from within the inside of the cheek. All information is documented through a Chain of Custody which ensures all test results are legally admissible. Private testing is just as accurate as our legal testing but can be performed in the comfort of your own home. You will receive your kit in the mail which includes easy to follow instructions, a collection envelope, mouth swabs, Chain of Custody form and a return, pre-addressed envelope. Once received at our laboratory, your results will be ready within 5 to 7 business days or for an additional $100.00 you can add a rush analysis which ensures your results are completed within 3 to 5 business days. Accelerated aging studies indicate that DNA treated with this process is stable for at least 11 years and probably significantly longer. 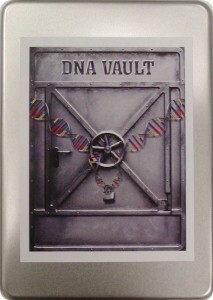 Your DNA is returned in a metal DNA Vault tin for storage in your home, a safety deposit box or anywhere else you choose. All that is needed to have your DNA preserved is a simple mouth swab from within the inside of your cheek to collect the DNA sample. In cases where a mouth swab is not an option, a forensic sample can be submitted for analysis.